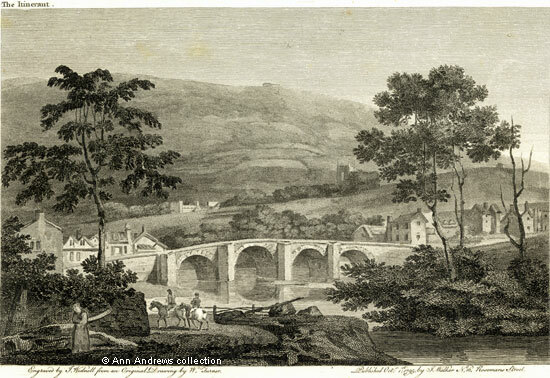 from "Beauties of England & Wales 1802"
Engraved by J. Widnell from an Original Drawing by W. Turner. Published Octr: 1st 1795 by J. Walker No 16, Rosomans Street. THE village of MATLOCK occupies a most romantic situation in Derbyshire, in the neighbourhood of that stupendous pile of rocks called the Torr, on the banks of the Derwent, which is here a limpid stream wandering among broken fragments of earth in a very fantastic manner, forming a scenery altogether picturesque and delightful. The soil is, however, wild and barren; but that for which this place is most celebrated, is the unusual petrifying property of its warm springs, and the vast masses of petrifactions that every where interrupt their course, such as are not to be found in any other part of the kingdom; these are manufactured for ornamental furniture, into vases, obelisks, &c. and may be considered as a staple commodity of the neighbourhood. The medicinal virtues of the waters of MATLOCK were first noticed about the year 1698, when a bath was built, and the original possessor only erected a small suite of rooms for the use of occasional bathers; since that period, however, the town has rapidly continued to rise in celebrity, and is now distinguished by every elegance of accommodation peculiar to other places of a similar description, viz. public rooms, a theatre, &c. The waters of MATLOCK are chiefly commended both for drinking and bathing in all impurities of the blood, relaxations, rheumatisms, want of appetite, and indigestion. The company who resort here during the summer months are more select than numerous, inasmuch as the place, on account of its situation, is better suited to a contemplative than a dissipated temper of mind. Notwithstanding the sterility of the soil, the hills about MATLOCK are much enriched with wood, which render the landscape on every side beautiful. The town itself has a very singular appearance from the houses being necessarily situated one overlooking the other, on account of the irregularity of the rocky surfaces on which they are erected, It is long and straggling, and from the bridge to the bath near a mile; its distance from London is about 142 miles, and from Derby 16. Whilst the engraving shows the northern side of the County Bridge over the River Derwent at Matlock, the accompanying text (transcribed above) is about to Matlock Bath. The area around Matlock Bridge shows some early development and St. Giles' Church is on the hillside. Joseph Mallord William Turner's landscape painting, "Matlock, 1794" is at the Indianapolis Museum of Art, Indiana, USA. See his complete works (an external link). The image seems to be the wrong way round. "Matlock", an engraving from the collection of and © Ann Andrews. Information provided by, researched, transcribed and written by © Ann Andrews.